2018: Wopat and Elise Zappia played in one AVP qualifier together. 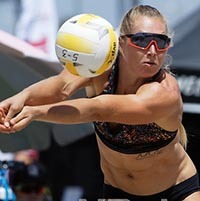 2016: Wopat made her pro beach beach volleyball debut with former Stanford teammate Karissa Cook, losing in the qualifier in Huntington Beach. College: Wopat played at Stanford, where she was a two-time AVCA First Team All-American in addition to being Honorable Mention her sophomore season. As a sophomore she her 1.63 blocks per set ranked second in the nation and was fourth best in Stanford's history, while her .383 hitting percentage was the ninth highest in a season at Stanford. Wopat's .399 hitting percentage as a junior ranked ninth in the country while her 1.45 blocks per set was 16th. Her senior season she led the conference and was 13th nationally in blocks (1.43 per set) while ranking 10th nationally in hitting percentage (.429). She left Stanford third all time in both total blocks (614) and average (1.38 per set), and had the second highest career hitting percentage (.392) in Stanford history. Wopat also played two seasons of beach volleyball at Stanford. Personal: Wopat's dad, Ron, placed 12th in the 1980 Olympic Trials in dacthlon while her mom, Kathy, competed in both gymnastics and track and field at UC-Santa Barbara. A First Team All-American in high school, Wopat was listed No. 4 in the nation in PrepVolleyball's Senior Aces rankings.